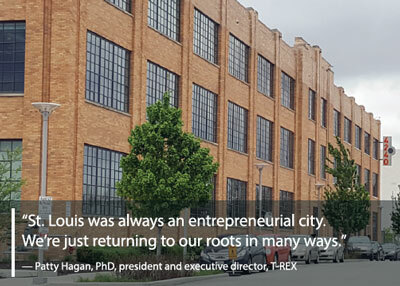 The connotation of “cortex” suggests the complex and magnificent human brain, an apt metaphor for the Center of Research Technology and Entrepreneurial Exchange (Cortex), a new innovation community near the Central West End in St. Louis. A new, one-hour documentary from the Nine Network, Smart People. Cool Places. The Story of Cortex, tells the compelling story of Cortex. Interviews with more than 30 people give first-hand accounts of how Cortex went from an idea to a model for urban, economic development. The idea for Cortex started in 1995 when questions were being raised about how the area’s excellence in the life sciences could play a bigger role in the region’s growth. Individuals, academic institutions and creative alliances began brainstorming together to find new approaches to collaboration and funding that might help propel economic growth. It wasn’t until a trip to Boston in 2002 by key stakeholders to learn how MIT used $6 million of its endowment to invest in the neighborhood surrounding the university that seed money was secured for the project. The five major partners at that time were Washington University, BJC Healthcare, St. Louis University, University of Missouri St. Louis, and the Missouri Botanical Garden. Cortex is now seen as a major hub for innovation in St. Louis and the Midwest. Its success piggybacks on the successful revitalization of the historic Central West End neighborhood. Cortex sits on a 200- acre site on the southwestern edge of Midtown. The mashup of different perspectives helps established companies thrive, too. Boeing, Express Scripts, World Wide Technologies, MasterCard, DuPont, and Monsanto all have space in Cortex. Like the Central West End to its north, the development of Cortex was also an urban value proposition. The now vibrant, mixed-use neighborhood has its own festival (Murmuration), Metro stop and anchor retailer, Ikea. The neighborhood is in the midst of a housing boom, with 2,000 new apartment units coming to market. The influence of Cortex cannot be overstated. “Cortex puts Missouri on the map,” says Randy Shilling, founder, OPO Startups, a coworking center for digital startups in St. Charles, MO. Smart People. Cool Places. The Story of Cortex was made possible by the generous support of Dr. William H. Danforth, Dan and Connie Burkhardt, Constance and John McPheeters, and Aries Rental Company. Produced by Patrick Murphy. Saturday, August 26 at 4:00 p.m. and 10:30 p.m.
Wednesday, August 30 at 10:00 p.m.
With more than 200 interview segments broken into seven chapters, the Nine Network explores the history of Cortex. View the archive.